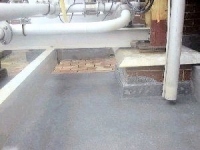 The image (below left) shows the floor beneath the Nitric Acid absorption tower where the hot gas containing the acid - in gas phase - is cooled and turned to liquid acid. 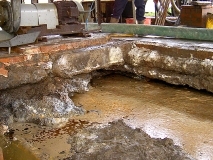 The failed polyester resin joints to the acid tiling allowed acid leakage, causing catastrophic destruction of the civil concrete beneath to a depth of over a metre. A huge hole had appeared under the absorption tower, threatening to bring the whole structure down. 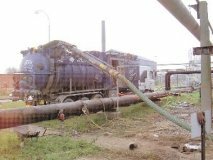 After neutralisation the hole made by the nitric acid was filled with compacted quarry bottom scrapings to a depth of 800 mm. 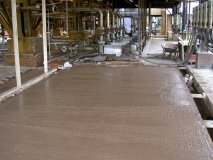 30N concrete was poured on top of the scrapings, leaving 40mm for the Durosil topping. 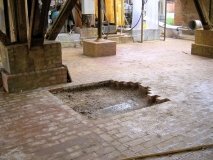 The DR11 was laid 40mm thick onto the green concrete, and damaged brickwork and plinths were reinstated using a combination of DR11 concrete and DR6 mortar. 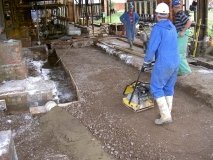 Using any other material would have taken at least 6 weeks, with the necessity to leave the site while the civil concrete dried out to <10% moisture content. 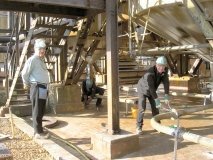 finished laying Durosil the plant engineers and fitters were able to start replacing plant and equipment and recommissioning the nitric acid facility. The work, from starting to neutralize the acid to handing back the plant, took 3 weeks. An effective repair and a huge saving. 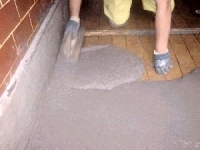 The polyester resin mortar originally filling the joints has degraded and allowed acid to leak onto and destroy the civil concrete, threatening to contaminate the ground. 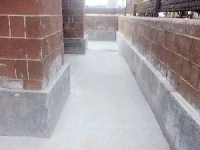 Durosil DR11 had previously been used to repair acid-corroded columns and plinths. 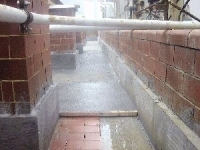 Durosil DR11 was cast as a skirting to the Nitric Acid Bund Walls and Tank Plinths, and flooded over the acid tiling as a 40mm screed to seal the bund. 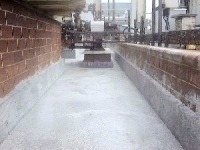 Durosil DR11 was cast to the base of the pump plinth, bund walls and tank plinths making a quick and effective repair. 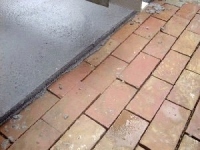 The images below show work in progress on the Nitric Acid Bund with Durosil DR11 being laid over acid tiling. Battens are set to lay the Durosil 40mm thick.